Kermit Lynch was once lost; participating in blind tastings, scoring wines, and decreeing wines for not being big enough, bold enough, or chewy enough. And then one day in a small village in Volnay he was saved. Saved by a beautiful pinot noir that was neither big nor bold but was spell binding nonetheless. And from that day forward Lynch became a proselytizer for the natural wine movement. Adventures on the Wine Route is partially a memoir of Lynch’s journeys through France searching out authentically and naturally made wines that express their terroir through subtlety and nuance and partially a philosophy on how truly special wines should be made. He abhors the use of chemicals and harsh processes such as reverse osmosis and over extraction rather believing the most gentle of means will allow the grape to express its true self. The stories are interesting and at times quite entertaining as Lynch recalls having a gun waved at him by one negociant who had become covered in horse manure and was obviously not sober. At no point in time does his philosophizing become tiresome, but rather it implores the reader to give lesser known wines that may express the character of the terroir better a chance for enjoyment. Adventures on the Wine Route by Kermit Lynch is a wine book with the rare combination of being entertaining and thought provoking. You may just find yourself among the converted and searching out shops that use him as their main importer. 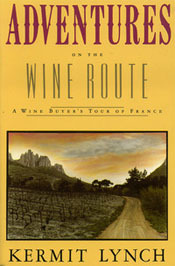 Recommended for anyone with an interest in discovering hidden gems in the wines of France.